How do I get to Newquay’s Holywell Bay Golf Club by public transport? The Holywell Bay bus stop is just outside Holywell Bay Golf’s entrance, so getting a bus to us is easy! Is there parking and do I need to pay? The car park at Holywell Bay Golf is FREE to use for all customers. Are dogs allowed at Newquay’s Holywell Bay Golf Club? Yes, we love dogs! If you keep them on a lead they can walk around our courses with you. Do you have a toilet and changing facilities? There are toilets in our Bar & Restaurant called Woodys. Please call us to discuss group bookings. 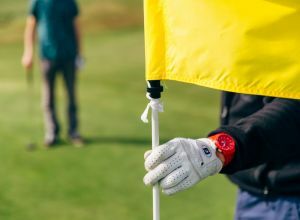 What should I wear for a day out at Newquay’s Holywell Bay Golf Club? 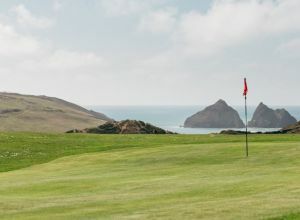 There is no dress code at Holywell Bay Golf, so rock up in your flip-flops and a t-shirt, or arrive fully kitted out! Are there any places to eat and drink at Holywell Bay Golf Club? We have a brilliant family friendly bar & restaurant right next door to Holywell Bay Golf. Serving delicious homecooked meals and snacks, please check opening times outside of peak season. Yes! There is something for all ages at Holywell Bay Golf. No! Turn up on the day or call us in advance, we don’t mind. 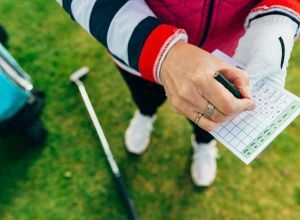 What happens if I lose an item of property within the Golf Club? Give us a call on 01637 832916 and we will do our best to return your items to you. Queue times will vary depending on the time of year. Please contact us to check which days we expect to be busy or refer to the opening dates on this website. As a Golf Club in Cornwall, we would advise guests that there is no such thing as bad weather, only the wrong choice of clothing for the conditions! There is very little cover within the Golf Course should it be wet and we would advise all guests to be prepared for rain. Is the Golf Club near the beach? Yes, we are a 10-minute walk from the dog-friendly Holywell Bay beach. I’m in Cornwall on holiday and don’t have my clubs, do you hire them out? Yes, we have golf clubs, balls and trolleys to hire.